AMRF researcher Crelis Rammelt participated in the inaugural Speed Thesis Competition organised by the University of New South Wales. One slide was permitted as a visual aid to assist in explaining the research to a mixed audience in less than 3 minutes. Have a look at our poster at the UNSW Well Being Research Showcase program. The diagram shows two basic processes: a physical and a social one. The physical process relates to technological and ecological assets; the social process to human and organisational assets. The processes run in parallel, and both roughly follow the three phases of surveying, organising and facilitating. The first phase leads to the selection of a village. In the second phase, AMRF assists the community with investments in new assets, such as a water option, a maintenance committee, knowledge, skills, and so on. In the third phase, AMRF’s direct involvement is reduced, as it begins to support activities leading to the sustainability of the water and health systems. The diagram represents work-in-progress, and will be elaborated as new findings emerge from practice. This documentary is the result of a collaboration between the Arsenic Mitigation & Research Foundation and the Environmental Policy & Management program at the University of New South Wales. It provides an introduction to the arsenic calamity in Bangladesh and to some of the efforts to address it. 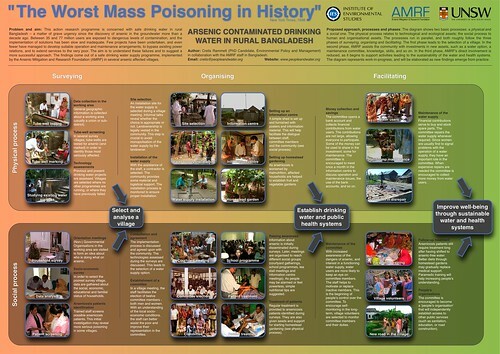 The Largest Mass Poisoning in History (2008). Videorecording. J. Merson and C.F. Rammelt. Dhaka, AMRF, Sydney, EPM Graduate Research Program at UNSW, JMA Production. 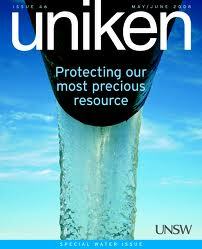 Published in UNIKEN, by S. Hamilton: As if devastating floods and grinding poverty are not bad enough, Bangladesh is struggling with an arsenic-contaminated water supply. Up to 70 million people are potentially drinking water contaminated by arsenic which occurs naturally in the regions underground water, according to Dr John Merson, Director of the Institute of Environmental Studies… Please read full article here. The 165th anniversary of Delft University of Technology (DUT) in 2007 was dedicated to Sustainability and Development. One of the major activities was that ten persons from DUT travelled to a project that it was involved in setting up. These persons had a critical look to the role of the engineer and how the project is situated under the local conditions. The travellers wrote reports on their journeys that form the focal point of the jubilee book. One academic visited AMRF and reported on her visit during a presentation given in a SPARKS colloquium on 4 March 2008.